My inner-nerd is giddy at times like this. Tonight as you gaze up into the sky, know that you are witnessing a rare event. Not Halley’s Comet rare by any means, but rare enough to inspire one of life’s great maxims as well as one of the most powerful and enduring love songs of all time. For centuries, the term blue moon defined the uncommon occurrence of a fourth full moon in a given season. This, according to the Farmer’s Almanac, has taken place 7 times every 19 years, or about once every three years. Since 1980, however, the colorful idiom has been redefined to refer to the phenomenon of a second full moon in a month. Tonight, for the first time since March, 2010, the respective orbits of earth and our moon will afford us the atypical opportunity to bear witness to a wonder of nature that LITERALLY only ever occurs once in a blue moon. The term does not have anything to do with the moon’s color, though at times our tidal regulator does, in fact, take on a bluish hue. A moon that is blue in tint, however, has nothing to do with its phase, but instead is brought about by particles of ash and other substances in our atmosphere – usually caused by volcanic eruptions and the breaking apart of small asteroids and meteors. 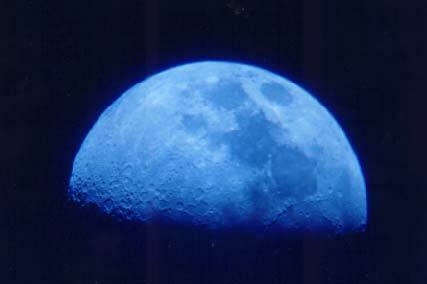 For citizens of the United States, the next blue moon is not scheduled to occur until July, 2015, or the better part of three years from now. So catch it tonight if you can. And for those hoping for an unexpected gift or blessing or surprise…tonight just might be your night. After all, those kinds of things happen but once in a blue moon. So yes, Lloyd, I’m saying there’s a chance. Madeleine Hayes and David Addison’s fledgling private investigator agency, aptly named for its unlikely success pinned on the improbable but palpable chemistry of its two principles. Moonlighting’s audience would quickly yearn for the affable stars to cut the witty repartee and become a couple already, but alas, would learn the hard truth that such an event could only actually happen once in a blue moon…as long as the ratings were good. That today’s definition of the term Blue Moon actually stems from a mistake. An astronomer in 1946 erroneously referred to a blue moon as the second full moon in a calendar month rather than the fourth full moon in a season. This faulty report was referenced in 1980 on a popular radio show, and the “new” definition was widely popularized through the pop-culture favorite, Trivial Pursuit. Once in a blue moon, a 500 year old term gets a new definition. Old friends might remember a comical version of the standard I used to sing during lunch, a rendition I only revisit these days…yup…once in a blue moon. Jerome John Garcia (“Jerry”) died 17 years ago today. For me, and for throngs of Jerry fans everywhere, it is a sad day. August 9 will always carry with it a somber note, a tinge of the blues evocative of some of Jerry’s more melancholy tunes, like Morning Dew or Stella Blue. For those that don’t like Jerry/The Grateful Dead or understand the appeal, I can only offer one possible line of debate. When you turn on the radio, depending on the station, you hear the same songs over and over again. And what’s worse, generally speaking, you hear the same boring version of said song. Top 40 is the worst offender, bordering on criminal (how many times can you listen to the same friggin’ Adele, Katy Perry, Nicki Minaj or Cold Play song? ), but all genres have a standard cue of 50 to 100 songs that their affiliated stations play non-stop, on a virtual continuous loop. The Grateful Dead offer a song catalog of nearly 700 songs. This doesn’t even include the songs side project bands such as the Jerry Garcia Band (JGB) add to the mix. Furthermore, because the Dead are a touring band that played more than 2,300 shows, pretty much every song in that catalog has many versions. So Sirius/XM radio station 23 is incredible because they play the full archives of a band that amassed the thickest songbook in the industry. Even though you are wont to hear Sugar Magnolia, Playin’ In the Band, Truckin’ or Jack Straw (among others) quite often, chances are, each time you hear the song in a given month, or even year, it will be a unique version of the song. How you like me now Ryan Seacrest? And Jerry and his bands were intriguing A) because they played great music; and, B) because you never knew what they would play when you saw them live due to their vast catalog and fearless approach to both writing original songs and covering artists across all genres of music. Jerry played nearly 3,200 live shows over the course of his lifetime as part of 12 separate entities. Not one of these live shows ever fell on August 9. This is amazing considering the date had no real relevance to Jerry (though it certainly does now to his fans, family and friends) and that he played enough to have just about crammed 9 different shows into every date. So not only is August 9 a terrible day in Grateful Dead history for the obvious reason, but also was a rare date that never had any positive Dead “spin.” And keep in mind that attending even the worst Dead (or JGB) show was better than pretty much anything else you could have done on any particular day. If you want to troll the net to prove my claim wrong, you may come across two separate shows Jerry may have played, one on August 9, 1969 as part of the New Riders of the Purple Sage, and the other on August 9, 1974 with Merl Saunders. Please note the fine print in the links I attached to each date above (the lostlivedead blog offers a decent argument that the New Riders played a run of shows at the Matrix in 1969 but not conclusive evidence that August 9 was among the show dates, and under the Notes section of the 1974 Merl show, pay attention to the fact that this show was likely played a day or two later, and again, no substantial proof has ever materialized to prove otherwise). My wife’s birthday happens to fall on August 9. Since we met, her happiness has always taken precedence over the anniversary of the death of one of my idols. As upsetting as the date once was to me, the fact that the love of my life was born on that same date has changed everything for me. There is positive significance to this date, and I recognize that my life is better because of August 9. You see, my wife is my silver lining of August 9…Jerry was the touch of grey…and we all will get by, and we’ll survive. And just for fun, I encourage you to read this article.